Well…since we were recently discussing books as gifts, maybe it would help some of you to learn some of the more “technical” terms you might see when shopping for a collectible book. I’ll do my best not to overwhelm you with information but I will try to give you enough information to help you make an informed decision when you decide to plunk down your hard-earned cash for your favorite book. Anatomy of a Book–I can’t draw so I’m going to use the image above (image credit: thefutureofpublishing.com) so you can see the various parts of the book. Most of us know what a title page or copyright page are but we may not have known the name of the top of the spine (headband) or what to call the paper glued down to the inside of the front cover (pastedown). 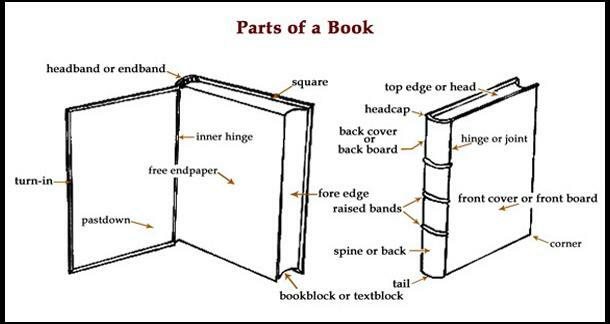 This is a pretty simple image with an easy layout of the most common parts of a book. Grading the Book–There are many ways to grade the condition of a book, but the most common method is as follows: Like New, Fine, Very Good, Good, and Acceptable. I think these grades are pretty self-explanatory but if you would like more details, leave a comment below and I’ll do my best to provide a more detailed explanation. Describing the Book–There are some words you will see on a regular basis when reading descriptions of books. Foxing, deckled, rubbed, inscribed, octavo, and remaindered might be a few words you’ll see in descriptions. Generally, these words refer to characteristics of the actual book, the hard cover, and the pages within the book. These words are not usually attributed to the dust jacket. I will make a list of the most commonly used words and their definitions in a follow-up post. Describing the Dust Jacket–The dust jacket on a hard cover book accounts for at least 50% of the book’s value (if the book was issued with a dust jacket), so make sure when you are looking for a book to purchase, that you look for a dust jacket that is in very good condition or better. The only time you might consider a dust jacket that is acceptable, or just good, is if it is a very hard to find book, a very old book, or a book going into your personal collection and you don’t mind the poor condition. A dust jacket in optimum condition will still have the original price intact on the top corner. Sometimes, you will read that a dust jacket is “clipped” or “price clipped”. This means that someone once gave this book as a gift and clipped the price off the jacket. Although this lowers the value of the jacket slightly, if it is the only undesirable part of the jacket, it is still worth purchasing. Determining the Edition–The most desirable edition will be the first edition, first printing (or first impression). There are many ways to attempt to determine if the book you want is the first edition. A reputable book seller will tell you in the description if the book is a first edition but they may not always tell you if it’s the first printing. Do your homework and find out what “markers” determine if the book is a first edition. Not all books have a number line and in some that do have a number line, the numbers won’t be in order. Sometimes the numbers go 1-10, 10-1, and sometimes odd to even (1 3 5 7 9 10 8 6 4 2). If there’s a number line present, you want there to be a “1”. Earlier books might just say “First Edition” on the copyright page. If you’re not sure if the book you’re looking at is a true first edition, don’t be afraid to contact your book dealer to ask them. If they’re reputable, they should have no problem answering your questions. Published by Delacorte Press, New York: 2012. Book is in very good condition. Dust jacket in very good condition. Pages nice and bright with no writing or marks of any kind inside. Spine straight and square. Binding is tight. This is a first edition/first printing. Not price clipped, not remaindered, not ex-library. Published by Random House, New York: 1945. Hardcover. Book Condition: Good. No Jacket. 1st Edition. Former library book with library stamps on all edges and full title page. Library stamp on inside front cover, library card still attached to inside back cover, and partial library sticker on rear endpaper. Nameplate of former owner also pasted on inside front cover. Hardcover volume. 390 pages. Gray cloth boards with stamped lettering on front and spine. Small chip on spine above publisher name. Boards are toned and browned from age, but remain in good condition. Binding is tight but inside front hinge is beginning to visibly wear. Head of spine shows visible chipping and wear of age. Front and back pastedowns show visible tape residue. Pages are slightly aged but clean and free of marks. SIGNED by Sinclair Lewis on the front free endpaper. A wartime book made to comply with the government’s request to preserve materials. Implied first edition. The difference in the descriptions is pretty obvious. The older and more collectible a book is the more specific the seller should be in his or her description. In the next blog post, I’m going to go into detail about the meanings of some of the most commonly used words and talk more about value. Hope I didn’t bore anyone and stay tuned!